Well…this will be my last baseball game until October…it’s sad but true. 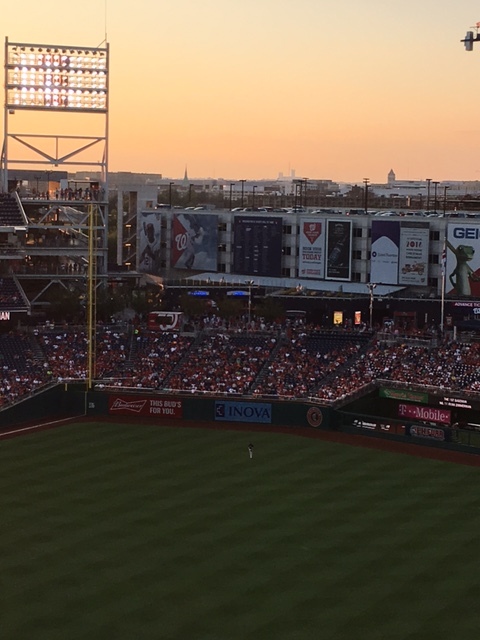 So, if you love the baseball game recaps then I’m sorry for you…and if you can’t stand reading about a baseball game…well then you probably never read the recaps anyway, right? 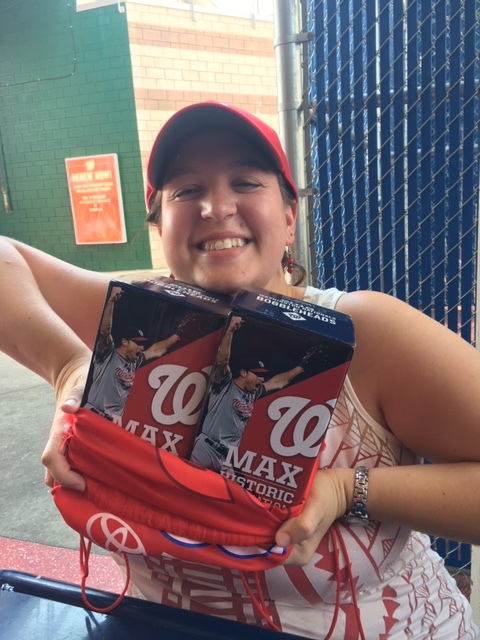 This past Friday my Dad and I made our way into DC and navigated some crazy almost 5 o’clock DC traffic so that we could arrive at Nationals Park in time to scoop up two Max Scherzer bobbleheads pre-game. 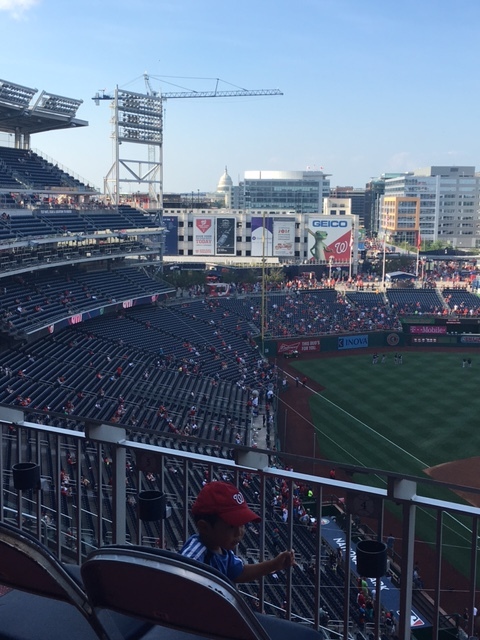 They were only giving away 20,000…that means that half the people at Friday night’s game wouldn’t get one and honestly; I don’t want to live in a world where I don’t have my Max Scherzer No-Hitter Bobblehead. Granted; I have two Max Scherzer No-Hitter bobbleheads, but that’s because he pitched two no-hitters during the 2015 season. 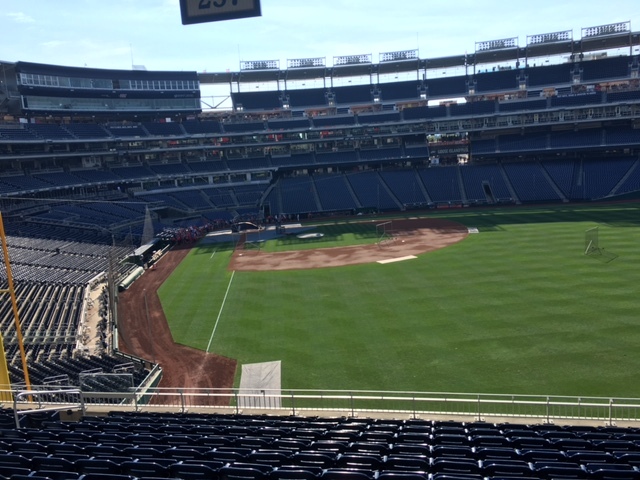 So early they weren’t even preparing the field yet…. My Dad is very fond of making the rounds of the park before a game – he likes to get in a certain amount of step and if he makes the loop around the park once, it gets him 8/10 a mile. And that’s without counting the walkways that curve behind the stadium winding a person back and forth as they go up the side of the building. It was safe to say we had some time to spare since we arrived to the park at 4:30 and the game didn’t start until 7:05. We waited just a bit for a food vendor to open…and then when they seemed to have some real issues with getting things going at the appointed 5:30 opening time…we moved onward and upward. 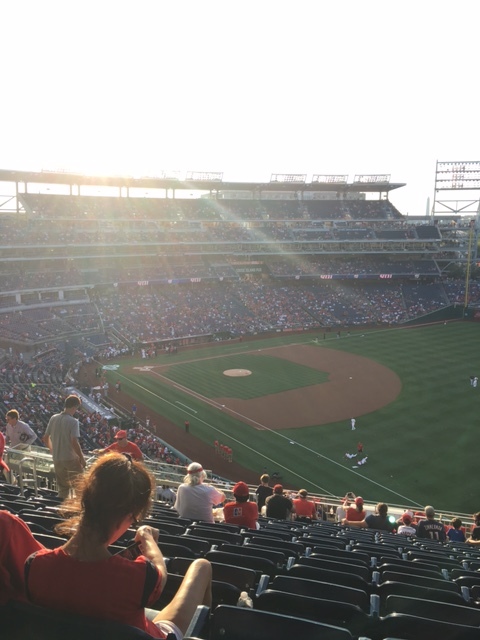 After the slight disappointment over not getting to eat BBQ, we got ourselves a bucket of chicken tenders and french fries and stood overlooking the field, watching the Quick Pitch game recaps in the breeze off the Anacostia river. 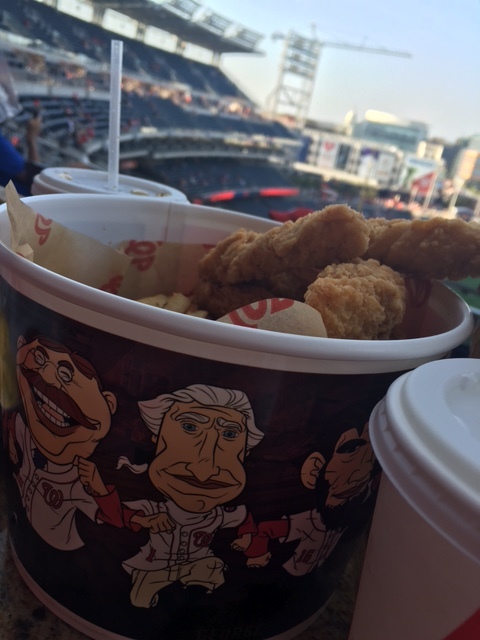 All in all, not a bad way to have supper on a Friday night… And while some ballparks might not have the best food, I’ve never eaten anything at Nationals Park that wasn’t tasty! They have some pretty delightful chicken tenders! The evening view from the Gallery level. Chicken bucket for the win! 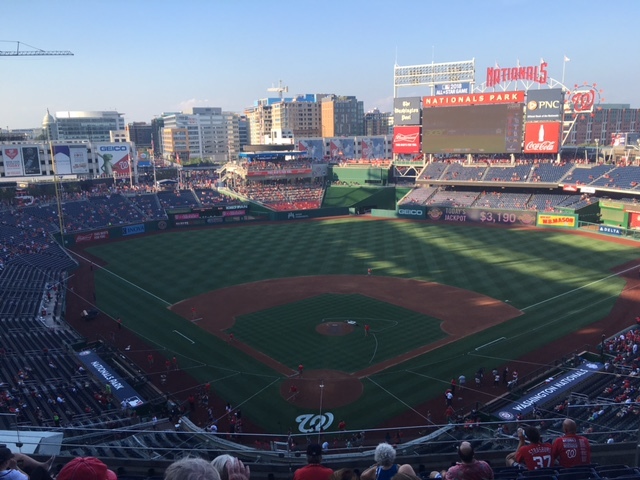 The game got under way after Frank “Hondo” Howard was inducted into the Nationals Ring of Honor. Hondo played for the Washington Senators and was nicknamed “The Capital Punisher” and the “Washington Monument” and led the Senators in hitting for most of his career. At 80 years old, Hondo is still very feisty and made sure to give Dusty Baker an economics lesson: depending on where along the bat you hit the ball…well, you’ll either make a lot of money or you’ll be let go.” Ha! He’s definitely a spitfire and a wonderful name to be added to the Nationals Ring of Honor. A spectacular Friday night view. An important factor in Friday night’s game was Trea Turner and his speed…you know what they say, speed kills. 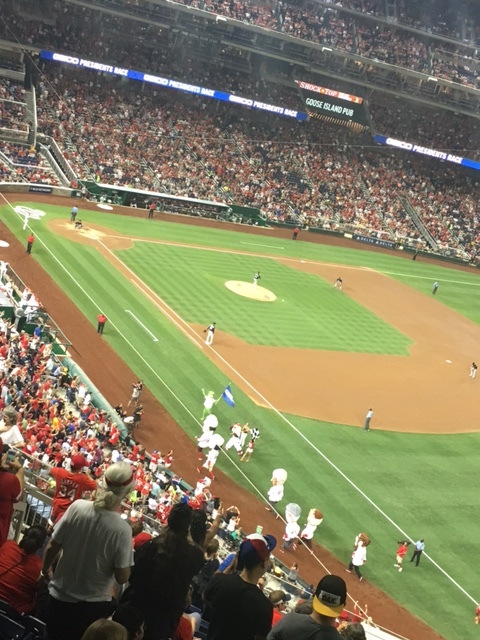 After reaching on an error, Trea raced toward first and his speed caused the Rockies player(s) to overthrow…allowing Trea to easily reach second. When attempting to throw Trea out at second a batter later…the Rockies overthrew again and Trea raced to third base. They don’t call him “the Jet” for nothing. His position on third base made it easy to score when Daniel Murphy hit a single and Trea scooted home and made the score 2-1. Gio; feeling generous as always, allowed two back to back doubles in the top of the fourth and the Rockies were able to even out the score to 2-2. 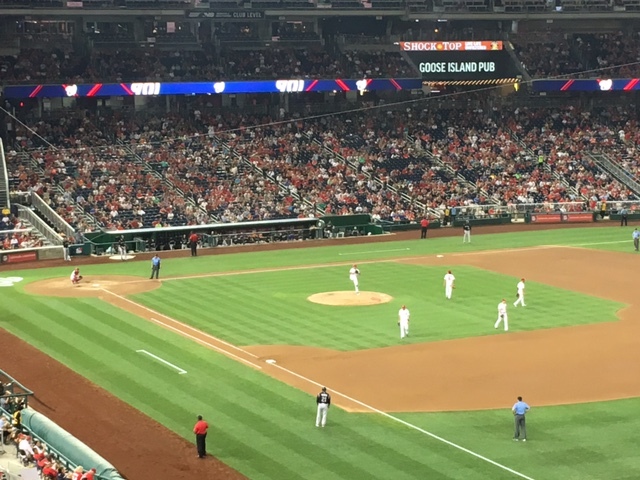 The Nationals struck back in the bottom of the fourth; Anthony Rendon doubled to start the inning and then moved to third on Ryan Zimmerman’s single. Jose Lobaton hit into a double play that easily brought Anthony home and made the score 3-2 Nationals..even if it did leave us with no runners on base and two outs. Not to deter Daniel Murphy, he came up to bat and murdered a baseball, sending it flying and making the score 4-2 Nationals; his 25th home run of this season and his 500th career RBI. Tom wins the Geico Presidents Race! Home Run – Daniel Murphy! 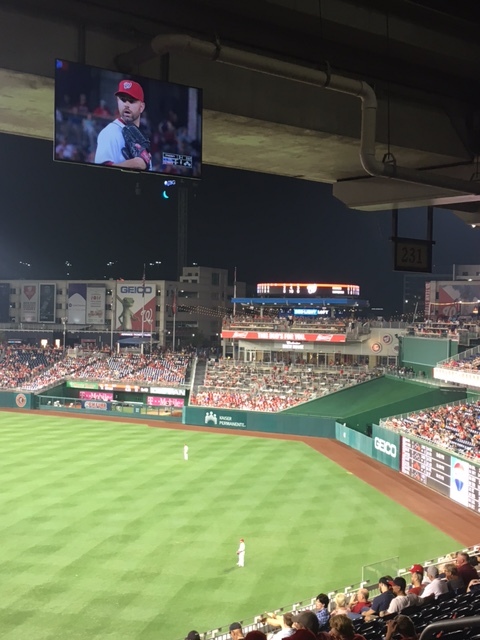 Gio was done after six innings and Koda Glover stepped in for the Nationals and shut it down in just fourteen pitches that included two strikeouts. 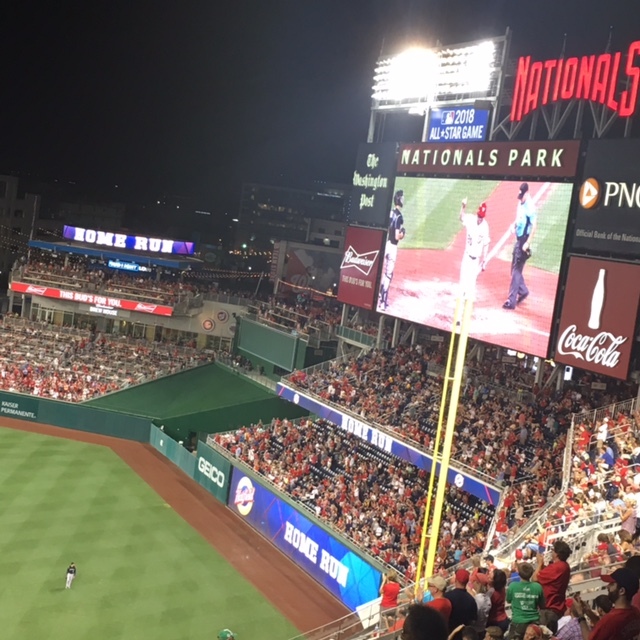 Trea Turner singled to start the seventh inning for the Nationals…stole second base and then took third on an error…again making it easy for him to cruise home when Jayson Werth doubled just a moment later, 5-2 Nationals. 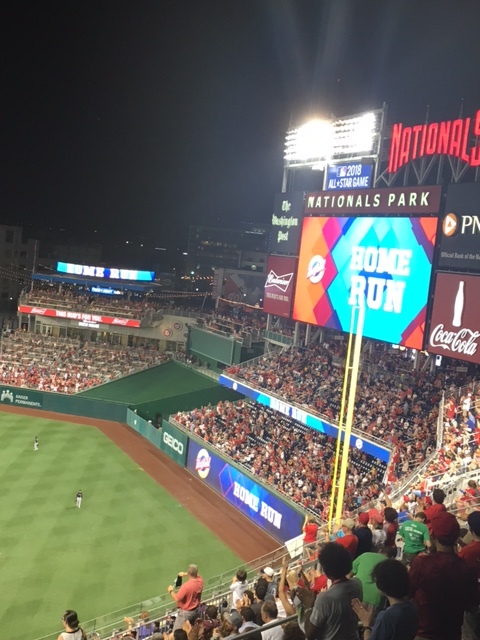 Werth moved to third base on a passed ball and Daniel Murphy was walked…so that when Bryce Harper tripled, they both raced home and made the score 7-2 Nationals! Harper would hustle home on Anthony Rendon’s sacrifice fly and make the score 8-2 before the seventh inning came to a close. 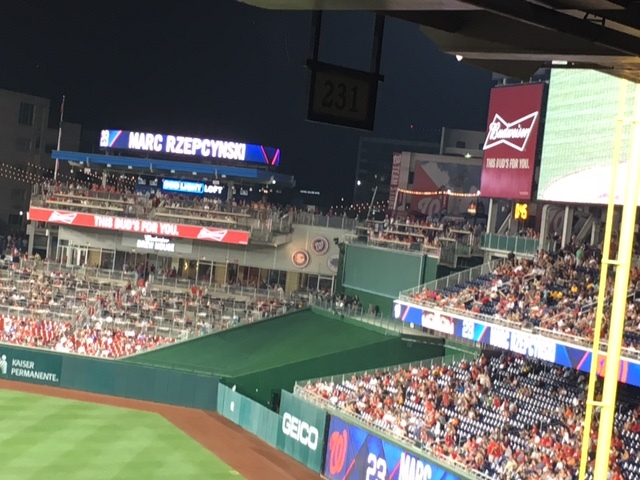 Koda Glover got a strikeout in the top of the eighth before Dusty Baker replaced him with the Nationals newest relief pitching acquisition – Marc Rzepczynski – say that five times fast. Or better yet…spell it, ha-ha! For the record it’s pronounced “ZEP-CHIN-SKI” but apparently he also simply answers to Scrabble. Scrabble retired one batter and hit another (oops…) before Shawn Kelley came in to close the eighth. 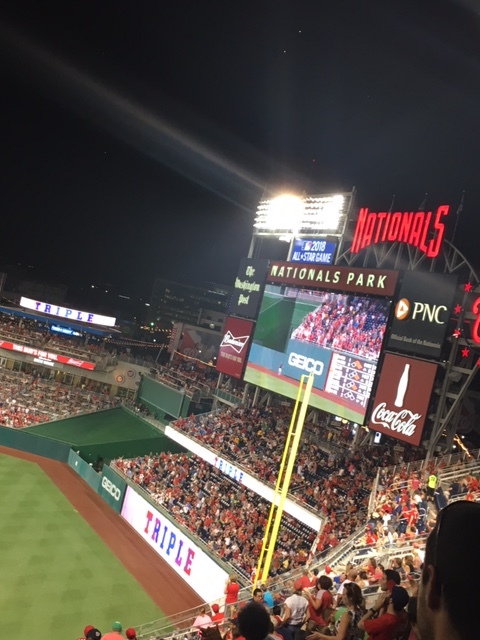 Kelley came back in the ninth and gave up a three run homer, making the score 8-5…and so Mark Melancon popped into the game long enough to shut it down and make the final score 8-5 Nationals. A triple for Bryce Harper – yes please! 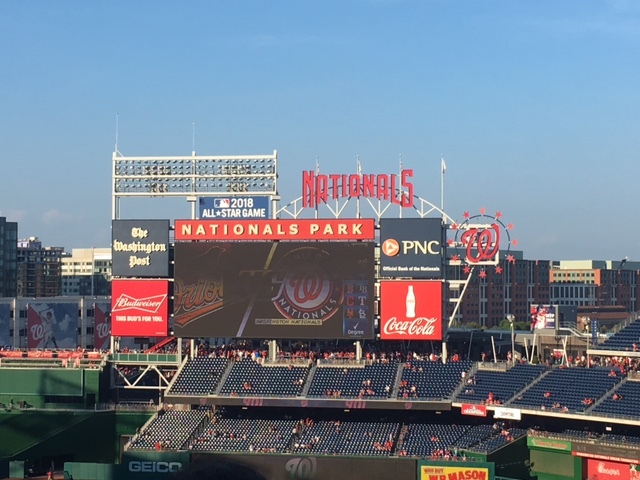 At the conclusion of this game, the Nationals season stood at 75-53 and they had an eight game lead on the Marlins in the National League Eastern Division. This win allowed them to move to the second best record in all of baseball behind only the Chicago Cubs…who I think anyone watching baseball knows are an absolute force this year. Whoosh! As of writing this article today, there are 31 games left in the regular season and the Nationals magic number is 23. It’s almost September and the Nationals are eyeing the post-season. I can’t wait to put my October Nattitude on display this year!